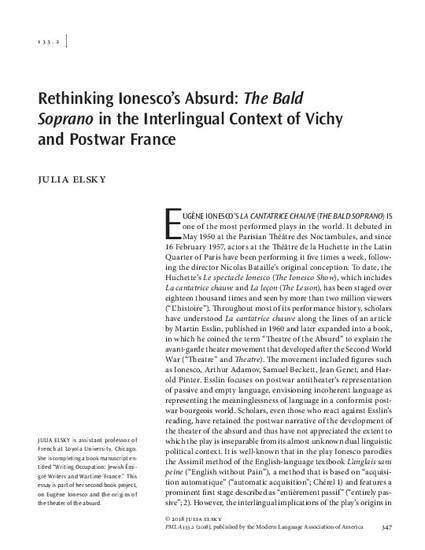 Rereading Eugène Ionesco’s postwar play La cantatrice chauve (The Bald Soprano) in the light of the original, wartime Romanian version alongside archival materials concerning his political activity in Vichy France allows us to reconsider his role in the theater of the absurd. Instead of staging the emptiness of language in a conformist world, the Romanian play dramatizes how language and language exchange created meaning but also upheld state violence during the Second World War. Although the French version of the play adapts this theme to the postwar context, traces of state power over language remain. This new approach to a central text of the theater of the absurd invites us to reexamine the politics of language and language learning in wartime and postwar France.